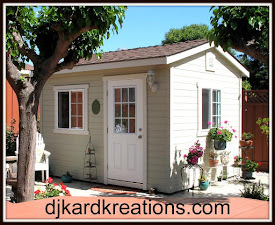 djkardkreations: Harriet's Birthday? FBW #252; MFW Gold; NBUS #50; STB! Harriet's Birthday? FBW #252; MFW Gold; NBUS #50; STB! Hi There! We have whooshed through another week in the blink of a star! Today is the birthday of my friend Harriet Skelly of Ally Cat Cards so my card today is dedicated to her. Happy Birthday, Harriet, and many, many more! I just got an email from Harriet thanking me for my card which I put in the mail to her a couple of days ago. She said, It's a bit early since my birthday is in November but I love it!!! What can I say? Ya gotta love me? It turns out that today is Harriet's wedding anniversary, not her birthday, and I didn't make that distinction on my calendar. 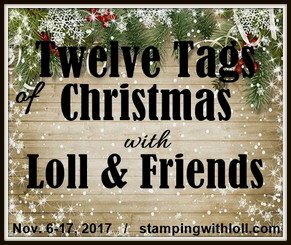 Well, boogers, I'm going to publish this anyway, since it's all written and then in November on her real birthday, all I have to do is send her a link to this post! In the meantime, Happy Anniversary, Harriet, and many, many more! Harriet is on the Design Team of the wonderful Flutterby Wednesday challenge blog, where the theme each week is, um, let me think ... oh, yes, butterflies! And/or fairies! Besides butterflies and fairies, the current challenge is to use autumn colors on your card. It seemed approbate that I play in this week's challenge while celebrating Harriet's special day! There is also an "Anything Goes" challenge going on at Seize the Birthday with an optional monochrome topping. How'd that work out for me the last three years? Yeah, no, not so well. The stack has been rescued. I resorted to resorting it and another time I will reveal where it now lives ~ hopefully it will prove to be a place where I will actually remember it's there and use it! Okay, back inside, recess is over. Returning to today's card, the other stunning feature of the card is that exsqueezit butterfly! I didn't make that neither. That was made by my friend Nancy on order from me. You can see the other ones she made for me here. This is the first time I've used one of them on a card so it's also NBUS. I know Harriet loves Nancy's butterflies, too, so I'm delighted to send her this one! Today we have THREE new friends in the Playhouse! I'd like you to meet Jeanne. Jeanne, if you have a blog, please let me know so I can edit this post and share the link. Please also meet Andrea of Arty Andrea and Bernadette Bliss of Sweet Paperbliss. Both of these card artists have the most incredible cards on their sites for your pleasure and your inspiration! Welcome to all three ladies! Thank you so much for joining our party! As I mentioned on Wednesday, I am taking off for a few days for a fun visit with a friend. I've already gotten behind in my visits to a lot of you because of limited computer time and now I'll get even further behind. That makes me sad. Thank you for your understanding and for being kind enough to continue to leave me comments! I'll catch up with you as soon as I can when I return. 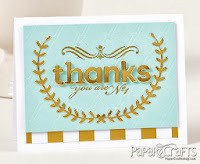 Stamp: PTI "Birthday Bash Sentiments"
Beautiful card....I had to laugh, but at least you didn't "forget" her birthday...lol...Moxie Fab World has a "gold" challenge going on, you should enter this there...perfect!! What a lovely card. I'm sure Harriet will display it from now until November, I would! I hope you enjoy your break. We will miss you of course but look forward to hearing from you soon. A lovely card, I love butterflies. It did make me smile when I read about your mistake but at least you sent a card even if it was for the wrong occasion! Forgot to say, I loved your comment on my art journal page. Gorgeous card Darnell, I love the beads added the butterfly and beautiful paper. I hope you have a fabulous time with your friend. ooops! well, it's the thought that counts! Great card in any case - how could Harriet not love it? Fantastic card for Harriet for her birthday Darnell. Beautiful paper! You enjoy a bit of a break Darnell, you can't be everywhere all of the time. Enjoy your visit with your friend! This is a beautiful card. Love the butterfly. Glad you are spending time with your girlfriend. I got to enjoy a day with one of mine yesterday and there is nothing like a great friend. Thanks, also, for sharing links for other new cyber friends. Love your beautiful card ....and pretty butterfly! Enjoy time with your friend. Have a fab few days away. Hugs Mrs a. Beautiful card. Love the paper and the gorgeous butterfly. Thanks for sharing it with us at Seize the Birthday. I'm so disappointed. I was hoping you were going to tell me how to make that wonderful paper. It makes a great background for that gorgeous butterfly. Have a great time with your friend and we'll see you back here soon. I will definitely display this card at least through my BD maybe longer! And I am honored that you used that butterfly on my card! I thought you made that paper - it is totally cool! Thank you again for this gorgeous card. Have a great visit with your friend! Hey, who's using my name? LOL Hi to your new follower Jeanne. I've been following for a couple of years! MY blog has not been updated in forever, not sure why - lazy, trouble getting pic off camera and on my computer. Anyway, Darnell, have a great few days off. Love your butterfly card. Love your butterfly card, Darnell! And, congrats to you on winning the PB stamps at LIM. Thanks for visiting my blog and giving me the heads up on being showcased! I might have claimed to have created that fantastic background and the ex-squeez-it butterfly...but we must give credit where it's due. We love how you do that. I don't always comment...but I always read your posts. I glance at all the comments and I know it's all been said and I don't want to add to the list of: to do's. Be well and enjoy your visit with friends. Stunning card! Perfect match with the paper and the exquisite flutter-by! Have a blast visiting your pal! GORGEOUS card - and how smart for you to be 'early' with her birthday! Yes indeed - gotta love you! And we all do! Have an exquisite time with your friend! Enjoy all kinds of shenanigans!! Hi Dippy - just a quick visit from me today as I'm chasing my tail as well (if only I could find it!). Love your card and all your NBUS - the paper is george-ous. Such a pretty butterfly as well. I'm so glad you do daft things as well. I sent a birthday card to a DT colleague only to find out I'd got the month totally wrong! Oops..... Hope you have a wonderful weekend catching up with your friend. Well done on your LIM win. Both the butterfly and the paper is super fantastic........and you put this card together just perfect! So lovely. Have a great time on your upcoming trip. Love, love, love this card, Darnell! That paper is to die for and it sure looks like it can be re-created. As for that butterfly - wow! This is beautiful!! What a fabulous card! I'm also glad to know I'm not the only one who sends cards a tad early or late...hehe!! 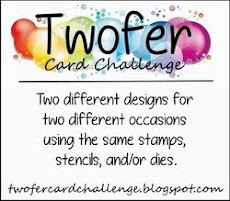 Thank you for playing along with my Flutter By Wednesday Challenge! Lovely card Darnell. Enjoy your time with your friend ! Such a pretty card, and fabulous paper. What a wonderful butterfly for a wonderfully talented lady! Love that paper. Hope you have a great visit with your friend. That's a gorgeous card with such a pretty background, and I'm sure Harriet loved it being super-extra early rather than late! LOL Have a great weekend! What a gorgeous butterfly card, Darnell!Yes, that background paper is wonderful ~ so happy you found it! Darnell, you are too funny! I love Harriet's beautiful birthday card, absolutely gorgeous. Enjoy your time away too. Love the butterfly Darnell, your card is AMAZING...love the background! What a beautiful card Darnell. It doesn't matter if you made the paper or butterfly you put it together with love for a friend. Hi Darnell, Lovely card even if it was too early I'm sure she'll treasure it until her birthday! P.s. Let me know how your show and tell goes! Beautiful card Darnell-I love that background(even if you didnt make it) and i LOVE that butterfly(even if you didnt make it! 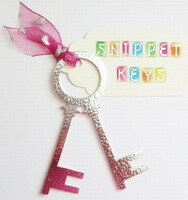 )you put them together in a fabulous way! Wonderful card Darnell!!! I must admit I thought that background was handmade.... Although its still beautiful just the same!!! 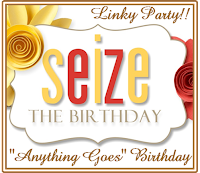 Thanks for linking it up with us over at Seize the Birthday! Oh what gorgeous paper & you used it to perfection with this card I so love! Just so you know--you're not the only one to send a birthday card 2 months early--LOL! You're such a sweetie saying I look young! Beautiful card Darnell no matter what the occasion! Bootiful card Ethel! Love that paper and thought you had made it - cheat!! GORGEOUS butterfly on this pretty card!! Hope you have a nice get-a-way! This is a wonderfully decadent card Darnell, I love all the gold and sparkles...beautiful darling! Gorgeous card! Oh, I had a good chuckle at your stash of papers. Isn't it funny how such useful thing can suddenly go unnoticed, but once you move it you wonder how you ever lived without it?! I hope yours is in one of those places now. This is just gorgeous <3 The gold butterfly frame is beautiful!! All that glitters is Gold here...love it! The detail on the butterfly is great! TFS! That paper was the perfect find! An elegant accent for that beautiful butterfly! I have missed visiting YOU my dear, you put BIG SMILES on my face, your so funny.. I scrolled back to see your work space, I mean play space, and I want to play with you in there looks like sooooo much fun. Now that card is GORGEOUSSSS. If it came from that pile of papers, I see, with my Magpie eye's some pretty papers there hhmm I'll be asking often if the cards you make come from the new space you have it in :O)..Off to your next post:).. Absolutely stunning card!! I think I have some paper that looks like that by Provo Craft..I think I ordered mine from QVC...Wow...how in the world I remembered that, I have no idea!! The butterfly is such a great touch accented with gold!! 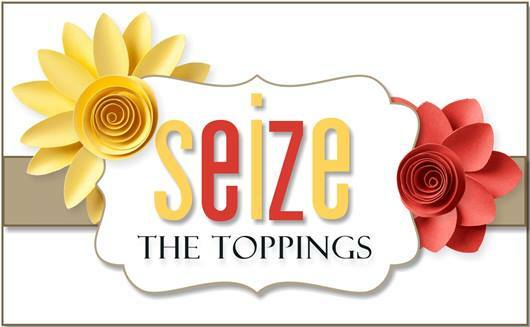 Thank you for joining us at Seize The Birthday. Congrats on being in the STB Birthday Honours line up Darnell! Have a fun weekend!!! Congrats for your well deserved shout out at STB! !